I first entered a gym over 30 years ago and from that moment on I was hooked on weight training and then bodybuilding, I still manage to train at least 3 or 4 times every week. I entered the competitive bodybuilding world in the 90â€™s when work sent me to a small country town and the local gym owners there encouraged me to give it a try. I really enjoyed the bodybuilding fellowship and so competed for several years always finishing in the top three both at regional and state level. From this I learned what it took to be competitive up there on stage and I love assisting those who are prepared to do the hard work it takes to achieve results. After many years of competing I decided to have a break and hopefully give something back to the sport I love so much. I really have to thank Jason here, for giving me the opportunity, way back in 2007, to see the show from the best seat in the house and I found out how exhausting but rewarding judging could be. I have judged at every Queensland show since then and quite a few National and International shows as well, moving through the ranks to finally become the Queensland Head Judge in late 2011. 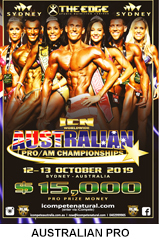 It is amazing how much the sport has developed in the last 20 or so years and it is a credit to the INBA Federation at the number of competitors who continue to show up on competition day. It is always a challenge with the number of competitors in each division, but I firmly believe in ensuring everyone is judged fairly and always spend the time to ensure we get it right. 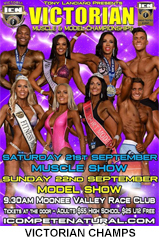 I am very proud to be associated with such a great Bodybuilding Federation and love being an ambassador for the sport. I am always happy to chat about the sport and am always prepared to give feedback and advice to anyone who wants it.